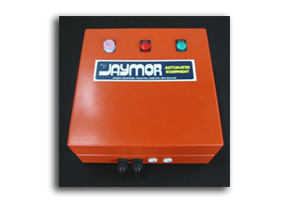 Jaymor Industries Ltd manufactures heavy-duty industrial metal detectors to suit individual customer's needs. The Jetscreen Metal Detector range will positively identify tramp metal before any damage is done further down the line. The detector will indicate the presence of tramp metal by either stopping the conveyer, sounding an alarm, rejecting a portion of the product, or reversing the belt. Any combination of these functions may be used in an installation to meet the customer's requirements. The detectors are commonly used in conjunction with a conveyor belt, which transports material to machines for processing. Detection of foreign metal will prevent both contamination of the product and damage to the processing machinery. Please contact Jaymor if you need any more information about our metal detectors or any of our other products.